There are a lot of long-lasting diseases that affects different walks of life. And one of that is Multiple Sclerosis or MS. According to studies, it is estimated that almost a million people in the United States have this disease. About 200 new cases are diagnosed every week in the US. In the world, 2.3 million people live with MS at present. People living in colder climates are more susceptible to MS as compared to those near the equator. Europeans also have a higher risk of developing MS as compared to Native Americans, Africans and Asians. In 2013, only 4-5 percent of all diagnosed MS cases are children. This occurs when the body’s own immune system attacks myelin (a fatty substance), which wraps around nerve fibers for protection. This protective cover is important because it prevents the nerves become damaged. If left uncovered, scar tissue may form. Once damage occurs, the brain can no longer send signals to the other parts of the body correctly. MS mainly affects the nervous system, which consists of the brain, spinal cord and optic nerves. An end result will be complications and problems with balance, vision, muscle control and other body functions. To keep track with this disorder, having multiple sclerosis apps helps in reminding patients when to take their medications. CareClinic features an MS symptom manager to make sure any person having the disease can easily record their health data for compilation. Just like most disorders, Multiple Sclerosis has no clear proof of how it came to be. But there are factors which makes a person vulnerable to it. A family history of a disease is one of the most common links. People have a higher chance of getting MS if their parents have it. But just to make it clear: it is not considered an inherited disease or disorder. Those patients who have had a viral infection ( Epstein- Barr or human herpesvirus 6) is more susceptible in getting MS. Aside from that, women are more likely to get MS than men, studies show. Smokers also have a higher risk in having Multiple Sclerosis. There are also studies that show how vitamin D helps in strengthening the immune system. This, in turn, protects the body from having MS, so lower levels of vitamin D in the system places the person in higher risk in acquiring the disorder. With all of these mentioned, it still boils down to the relationship of the brain and immune system. Researchers suggest that the body’s immune system may mistake normal neurons for foreign ones. MS, unlike other disorders, has an episode of neurological symptoms called clinically isolated syndrome (CIS). This usually lasts for a day and happens quickly when the immune system mistakenly instructs the body to attack myelin. Demyelination then occurs and may cause lesions or scars. CIS has two types: a monofocal episode and multifocal episode. Common symptoms are optic neuritis and numbness. Once you find out if you do have these signs, it is best to rule it out first from many other nerve disorders. Seeing a doctor is ultimately the best thing to do so that there will be no complications. Symptoms vary from one patient to another, in which some may not need treatment at all. Severe symptoms of Multiple Sclerosis can also mean having trouble in performing even the most basic tasks in life. The first symptoms start showing between the ages of 20 to 40. Those already diagnosed with MS experience attacks (relapses) when the condition is getting worse. Some, on the other hand, has this disease worsen over time. Aside from this, MS also has secondary and tertiary symptoms. Secondary symptoms are usually a product of the primary MS symptoms and not because the myelin sheath is damaged. This include bladder infection, shallow breathing, and low bone density. Tertiary symptoms of MS usually focus on the social and psychological aspects of life having this disorder. Difficulty in walking might affect your job and will eventually make you depressed. Since it is hard to get around and socialize, you would end up with self-pity and curl up in your comfort zone more. So MS can make or break you – depending on how you handle it. Since the origin of the disease is unclear, physicians also find it difficult to diagnose MS since it can be mistaken for other nerve disorders. A neurologist is the best specialist to see if you are starting to show some symptoms. Aside from family history, the physician will need some blood exams, MRI and cerebrospinal fluid analysis. Evoked potentials test is also done to measure the brain’s electrical activity. Once you are diagnosed of MS, the specialist will then see what kind of treatment to undergo. Mild flares usually go away on its own, but if they don’t doctors usually prescribe high-dose steroids intravenously or by mouth. When a flare does not respond to steroids, a plasma exchange is usually suggested. The doctor will remove the plasma content and mix it with a protein solution. Another thing would be symptom control. Medicines such as baclofen, tizanidine, bupropion, tolterodine and clonazepam may be taken to ease the symptoms. Lastly, physical therapy is suggested so that you stay active safely during the course of MS treatment. To get around more easily, trained health care professionals will teach you how to use a walker, can or assistive device. As what specialists always remind MS patients, taking medications entails hard work as well. That’s why using an MS symptom tracker app eases the burden during those busy days. These drugs must be taken at the right time with the correct amount. CareClinic helps in sending prompt reminders for patients. 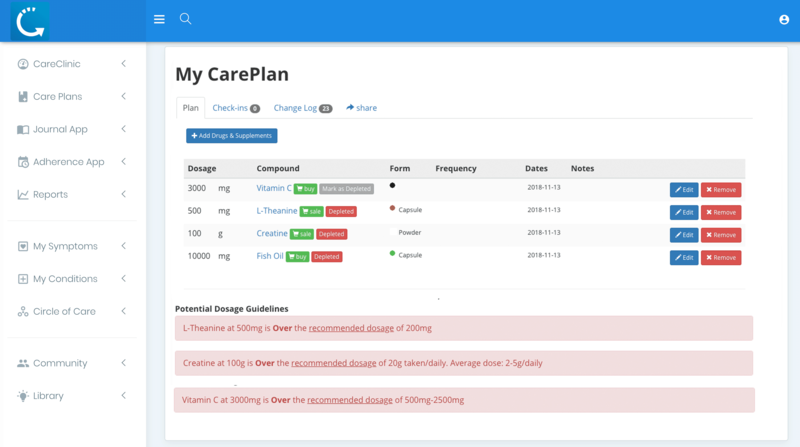 Manage your MS efficiently with CareClinic as you can easily document and record symptoms on a daily basis. The app has a symptom diary in which you can indicate muscle weakness, visual problems, coordination disorders and more. This health record is very important to share with your doctor to monitor the prognosis of your MS. Your doctor will also have an easy understanding of your progress and the effectiveness of treatment. Since this particular CareClinic’s feature automatically saves all recorded data (medication, symptoms and therapies), it then serves as your health report every time you visit your doctor. Once data is compiled, simply print the report and bring it to your next doctor’s appointment. Be open and discuss everything with your doctor as he or she can help monitor your symptoms well and review treatment / therapy moving forward. Your health professional may also suggest other alternatives that are worth a try since each clinical case is unique. Some provide vitamin D supplements to help out with MS, add vitamins and medications to be taken to CareClinic to be reminded of when to take your pills. Another would be having acupuncture in which symptoms like pain, fatigue, numbness, spasticity, tingling, and bladder problems are effectively addressed. Having an MS symptom tracker is indeed very important to be able to live an improved life. Knowing the frequency of these symptoms with help you understand and know what to do once these are triggered. And being knowledgeable of this disorder will also help you manage well to live a full and active life. Life does not stop if you have Multiple Sclerosis. Accepting the disorder and being cooperative with treatment and therapy will only make you feel better eventually. To get started with the web-based printable tracker or mobile app for Android or iOS, click here to register.